In SUPPLY Tom Brown, Henk Gieskens, James Halliwell and Roos Wijma provide for the need of new art. These twenty-somethings are not only exhibiting their art but also that which drives them as artists, their inspiration and view on the meaning of art in our world of transformation. Their art takes us by surprise as it comes alive. As there are finished pieces as well as various studies on display, the focus of the exhibition is dedicated to studio practice. In their studio these reflective artists are rethinking and reusing matter, whether this is the ‘image’ or ‘canvas’ or ‘frame’. 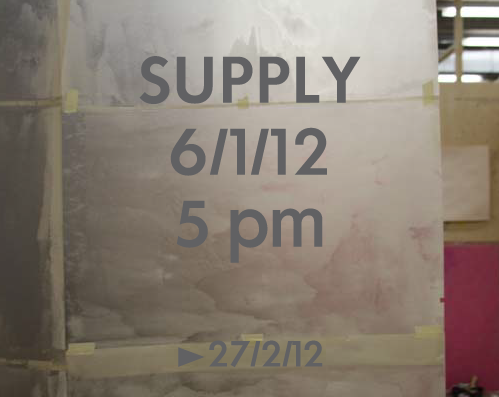 SUPPLY is an exhibition that establishes a crossover between London and Rotterdam, creating an exchange, bringing together artists at the point of their final year of Art school in these two cities. Later on this year the show DEMAND is scheduled in London. Wallgallery is not a commercial enterprise, nor a hobby, but a radical concept to live with art and bring it into the world. It is space for experiencing art inside the privacy of a lofty apartment in The Red Apple in Rotterdam. A rough concrete wall high in the sky defines the room and screens off the outside world. It also offers back-cover for the panoramic views and can hold an experimental vision. Every season an exchange of art -or whatever idea transformed into reality- takes place in an open minded environment. Each presentation aims at turning views into vision. This entry was posted on 24/12/2011 at 00:08 and is filed under information, programme. You can follow any responses to this entry through the RSS 2.0 feed. You can leave a response, or trackback from your own site.